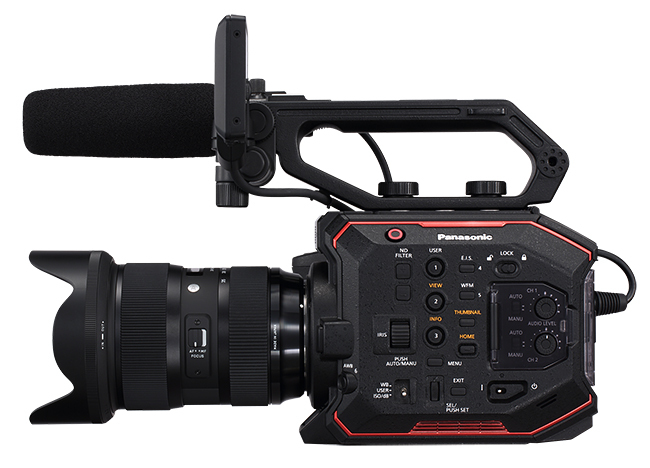 Panasonic has announced a firmware upgrade to its AU-EVA1 compact cinema camera that, among many improvements, will see the camera capable of recording ALL-I codecs and outputting RAW. The free upgrade, available for download from the end of March 2018, means the super 35mm sensor camera will now support Panasonic ALL-Intra codecs, RAW output, time lapse recording as well as a new HD 422 interlaced codec, for TV applications. Remote operation is now possible using third party wired controllers, allowing focus and iris control for diverse lens options, as well as zoom control for Canon compact cine servo zoom. Additionally, six Sigma ART lenses are also newly supported. LCD signal cloning to HDMI, as well as additional home screen indicators improve monitoring in the camera. To enhance workflow, Panasonic has added the capability to output ancillary data for RAW such as time code, RAC flag and also VANC metadata on SDI. Since its release in late 2017, the EVA1 has been used extensively in independent filmmaking, commercials, documentary and live events. Featuring a native EF and optional third-party PL mount, the EVA1’s small form factor makes it ideal for gimbal and drone applications, while the colour science and dual native ISO adopted from the VariCam makes it a great B camera for bigger productions utilising the VariCam. The firmware will be available for download from the Panasonic Broadcast global support page at https://pro-av.panasonic.net/en.